Elvis World was certainly bizarre but it became even more so on 19 December 1970. The full circumstances are not known, as we don’t know precisely what Elvis was thinking. In another life, he surely would have been a cop as he loved collecting police badges. He loathed the big rock acts of the day and how they embraced the drugs culture. He felt that they were messing with the minds of the young and he, Elvis Presley, the King, wanted to do something about it. He spoke to John O’Grady who gave him the name of John Finlator, a senior official at the Bureau of Narcotics and Dangerous Drugs. Elvis decided that this was more important than a telephone call or a letter – he would go to Washington and see him in person. Early on 19 December 1970, Elvis dressed in dark glasses, a purple velvet suit and cape plus his gold belt from the International, a Colt .45 in a shoulder holster and a Derringer in his boot. He was a carrying a bejewelled cane. If he was planning to go incognito, it wasn’t the best of starts. If he wanted to draw attention to himself, he couldn’t have done better. He even wore mascara. He drove to the airport and bought a ticket to Washington on the next flight. Being a VIP, he wasn’t checked for weapons but just gave a few autographs. This was a great adventure, he had never done anything like this before. He didn’t encounter any problems – he was recognised but most people thought he must be an impersonator. Elvis Presley wouldn’t be flying business class. Arriving in Washington, he asked a cab driver to take him to a good doughnut joint and wait for him. A hoodlum wanted to relieve him of the diamonds on his hands and Elvis pulled back his jacket to reveal his gun. He felt excited: this was a great adventure. The manager at the Washington Hotel recognised him but accepted his alias of Colonel Jon Burrows. Entrenched in his suite, Elvis paced up and down and didn’t know what to do next. The good folk at Graceland were thinking the same thing – Elvis had gone missing. He was a fully grown adult: they could hardly alert the police and ask them to find Elvis. Elvis had determined the next stage of his mission but he needed somebody to help him. Jerry Schilling had left the Memphis Mafia to work as a film editor in Hollywood. It was the weekend and he rang Jerry and told him to meet him at the airport in Los Angeles. When he arrived several hours later, Jerry rang for a doctor as one of Elvis’ eyes was swollen. He was given a shot that knocked him out and enabled him to sleep. You might have thought that the boys should have kept checking out Elvis’ Hollywood home on Hillcrest Road but they didn’t. At 10pm that Sunday evening, they took off for Washington with Elvis carrying a wooden box containing an antique Colt.45 as a gift for the President. By sheer good fortune, Elvis found himself next to the Republican senator George Murphy. Murphy had been a song and dance man in Hollywood musicals in the 1930s. He was therefore sympathetic to a singer showing an interest in politics. Elvis wanted to offer his services in the war against drugs and then meet the head of the FBI, J. Edgar Hoover. Murphy said that he would help him – and Presley’s ambition now had no bounds. Why not meet President Nixon himself? Encouraged, or perhaps humoured, by Murphy, Elvis wrote a rambling letter to Nixon in which he was appalled at the drug culture, the Black Panthers, the student revolutions and the hippie community. Elvis was declaring war on the 60s, he wanted to be back in his heyday, the mid-50s. He was hell-bent on revenge. When they got off the plane at 6.30am, Elvis, still in his outlandish clothes, went with Jerry to the White House where he handed in his letter which asked Nixon to call him at the Washington Hotel. By now, Schilling was fearful for his own job. He wanted to ring Graceland to tell them where he was and request Sonny West in his place. Elvis said, ‘Okay, you do that and wait for a call from the White House’ as Elvis himself would go to the Justice building and meet John Finlator. Possibly George Murphy had arranged this. Finlator was patient and pleasant but said that the government regulations did not permit him to give Elvis a badge. Only agents of the Bureau could have a badge. Elvis phoned Jerry to say that he had not received his badge, but Jerry gave him good news; the White House had phoned. Luckily, Nixon liked to keep an open hour in his daily schedule in case anything special occurred. 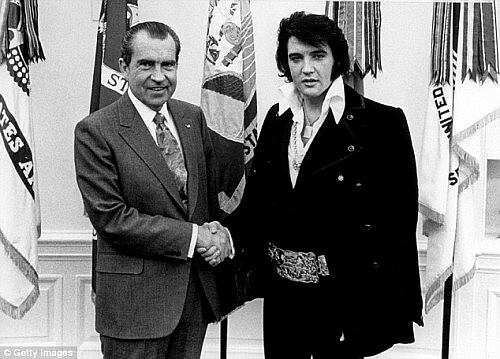 President Nixon had cleared his schedule to meet Elvis. By good fortune, Nixon was about to launch a crusade against the drug culture. He called it America’s No.1 problem and he could have America’s No.1 star on his side, although that is not how Elvis saw it. By the scheduled time to meet Nixon, Sonny West had arrived and Jerry had stayed on as he wanted to meet the President too. They went to the White House, but all the president’s men said that only Elvis could go into the Oval Office to meet Nixon. As soon as Nixon saw him, he said, ‘You dress pretty well, don’t you?’ to which Elvis responded, ‘Mr. President, you got your show to run and I got mine.’ Great answer! The official photo of Elvis and the President is now the most requested photograph in the Government’s archives. It’s a great photo but it looks like Elvis is once again performing for Ed Sullivan. Knowing Nixon’s obsession with recording, their conversation must have been recorded but it has not yet been released. When it is finally cleared, it will be the comedy download of the century. Doubtless Elvis gave his views on the drug culture, the bad influence of the Beatles and the political activism of the actress Jane Fonda. Maybe Nixon agreed: young people were going to hell because of today’s music stars and Elvis could communicate to the youth and get through to them. He was opposed to today’s rock stars, and the deaths of Janis Joplin and Jimi Hendrix from overdoses made his point. Presley told Nixon that he wanted to be a federal agent at large and Nixon said, ‘Getting you a badge is one thing I can do.’ He could overrule the Justice department. Elvis made a small request – could Jerry and Sonny meet the President. Nixon agreed. ‘You got a couple of big ones there, Elvis, I bet they take good care of you.’ Nixon gave them cufflinks with the presidential seal and when Elvis added, ‘They got wives too’, Nixon found two pins with the same seal. Oddly, he didn’t request something for Priscilla, who didn’t even know of the visit. Having been told to leave his gift with security, Nixon asked to see it and so Elvis showed him the Colt.45 in its presentation box. Nixon thanked him and said he would be in touch. Elvis returned to Graceland for a quiet family Christmas. He spoke confidentially to David Stanley. He said, in all seriousness, that the teenager should report to him every day after school and let him know who was selling drugs and where. He didn’t add that he would buy them but he might have done. Elvis was on a lot of shopping lists that Christmas. On Stage was still a big album and Elvis: That’s the Way It Is had been released. For oldies fans, there was a 4LP box-set, a relatively new innovation, Worldwide 50 Gold Award Hits, Volume 1, which was the deluxe gift. The UK price was £7.50 and included a portrait album. By calling it Volume 1, RCA had confidence and indeed, Volume 2 arrived for next Christmas. This time there was a bonus – an authenticated piece of one of Elvis’ suits. C’mon, who’s got his fly? Somebody gave Elvis one of those laughing boxes. He loved it. He would set it off and say, ‘Meet Colonel Parker’, but Colonel Parker wasn’t laughing. He had a very uneasy Christmas. His boy had been out on his own for the first time and met President Nixon. What would he do next?